In the service of helping novice visual journalers everywhere feel better, looser, more comfortable with their own pages… I present to you my crapolicious first visual journal. I admire my first efforts to persevere in the face of disaster – the way I delighted in each new page I completed. And oh, how I labored over every one! The entire process was vaguely troubling. I was unsure of what I was doing and why I was doing it. But page after page I kept at it and gradually my doubts were replaced by…… more doubts. HAH! I enjoyed what I was doing, but it didn’t feel authentic. At times I relied too much on the ideas of other people and this felt false. I wanted to be my own compass and point the way more deeply into myself. My heart and brain remained in a tangle until Visual Journal 6. I’m slow like that. Stay tuned for more confusion in my next installment. hahaha! that little monster guy at the end was great. thanks for sharing your journal growth. I’m thoroughly enjoying your videos. There were several of these pages that I really liked. One of my favorites was the Martin Luther page, but I’m curious about the A. Who is the lady? Thank you! It is amazing to see how we all develop. I look at my early stuff and wonder what I was thinking or trying to do…usually when I was trying to imitate someone else. I still get that funny feeling…”it’s not like what’s popular” so something like that! Too judgemental. I’m getting more confident with my own thing. Throughout your journal I could see pieces of you emerging! This is big – what you are doing. I know it is large for you as it is for us who witness it. Your visual voice is peeking out even before the pages where your photographs appear. Documenting it this way allows it to be caught as it emerges. Technical questions: how long a video does yr camera take? And where do you have the camera and tripod set so it is looking down-ish over your shoulder-ish? and good work on holding yourself back from humming or commenting as you turn – doing this just invites vocal accompaniment. I like your little orange helper guy. Well, this is a great service. It is interesting to see these journals, and it’s really helpful. Thank you for sharing these! They were doing Carson that long ago, I didn’t know that! Thank you for sharing! I have been following your blog for quite a while now, but I never comment. I love seeing your visual journaling, your pages are so beautiful, but I am always a bit intimidated because I don’t think I could ever make anything as beautiful as your work. Seeing this post today made me realize that everybody starts somewhere and that I just need to do it and follow my own path. Thank you so much for sharing your beautiful work with us! Your line about not feeling authentic is perfect. Everytime I see a different form or style I like I want to try it but it often feels like “their way”. I do bounce around a bit because I think I have artistic ADD or something. Mary Ann, I would like to say thank you so much for sharing – it is very generous of you. 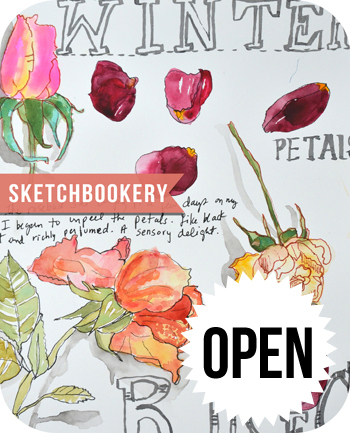 I made my first art journal this year – muddled my way through. Seeing your first books and your growth is magnificent. I can see “you” beginning to surface in this journal. I especially love your “little friend” Happy New Year!! I like this one, and I see your style emerging pretty fast. I like that you used your own photos right away. I am still having trouble using my photos, I get this wierd scrapbook vibe when I do, sometimes. I am very inspired by your marvelous videos, however, I am troubled by the implied logic that we are to actually “finish” something we start. I must have been in the ladies room during that part of the orientation. I will need some make-up time please to finish the nine or ten visual journals I have started. (I plan to bring a note from my parents, but that might take a while due to the fact that they have, as they say on Ghost Whisperer, crossed over).